Hacienda Sonora is a farm located in the Central Valley of Costa Rica, at the foot of the world renowned Poas Volcano. The farm's area is approximately 100 hectares, which is composed of 65 hectares of shaded coffee, 25 hectares of wild forest reserve, and 10 hectares of sugar cane. The average altitude is 1,200 meters above sea level. InterAmerican Coffee is a long-time partner with Sonora. Alberto Guardia began growing coffee at Hacienda Sonora 45 years ago. His son, Diego Guardia was born and raised at Hacienda Sonora, and obtained a Mechanical Engineering degree at San Diego State University in his early 20's. After he graduated, he worked for two years as a construction engineer in the State of California before returning home to work with his father to improve and maintain the family operation. Sonora's coffees grow in an environment surrounded by exotic trees and other vegetation, providing a great condition for quality, as well as improving the chemistry of the already naturally rich volcanic soil. Thanks to the farm’s diverse ecosystem, many different species of birds and animals seek refuge in the land. 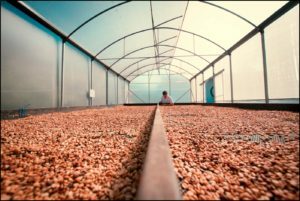 Sonora has a well-known reputation for commitment to quality micro-lots, specific varietal and processing separation, and fulfilling their goal to leave a positive impact on the environment and people that surround their business. All of the energy consumed by the farm is 100% renewable energy harvested on the farm powering the mill and electricity for local workers. 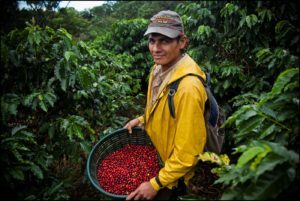 In 2010, Diego began to also work for InterAmerican’s “sister” company CECA Palmichal Coffee Mill and exporting company in Costa Rica to focus on a micro-lot program. In 2015, the Palmichal Micro-Mill began by processing up to 5 to 100 bags from 1,200 specific micro-lot farm and varietals. Ceca traditionally sources SHB, Fancy SHB and Tarrazu green coffee from over 2,000 coffee growers in the Tarrazu region. Their nursery program experimented with planting 350,000 plants in 2016 with high quality rust resistant materials, and offers special financing to coffee growers. Ceca buys various qualities from over 80 suppliers throughout the country and works hard to fill specific clients’ needs. The El Cerro natural is 100% processed natural. El Cerro is the name of one of the parcels at the Sonora farm, processed just like the other naturals. The varietal is Red Catuai and it's harvested the same as the other coffees at Sonora by picking only the real ripped cherries. They tend to have pretty consistent cups with varietals through the different plots, however the El Cerro one was particularly different this year.